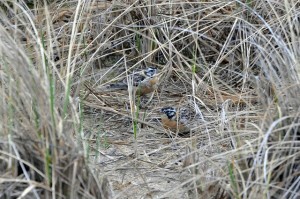 Karen Mansfield and I found a male Smith’s Longspur in the dunes this morning. The bird was initially in the open sandy and grassy area just south of the cottonwoods, but after a few minutes it flew north and landed in the dunes north of the cottonwoods. We didn’t follow the bird after the initial observation but others reported that this and a second Smith’s eventually flew off to the west and were not seen again. This is only the second Smith’s Longspur I’ve seen at Montrose in over 30 years of birding there. 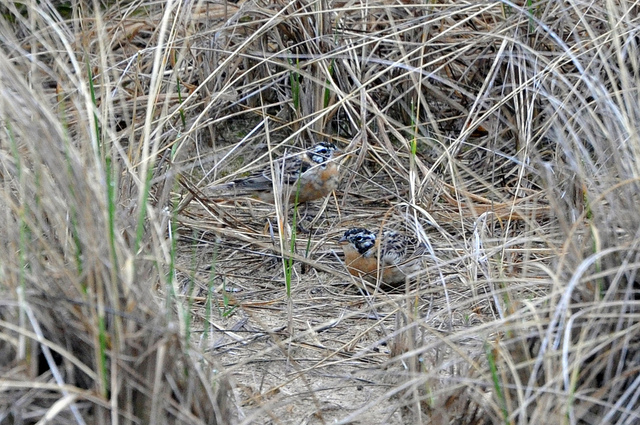 In addition to the Smith’s, a Grasshopper Sparrow was in roughly the same area of the dunes. I also had a small loon flying north that was almost certainly a breeding plumaged Red-throated. Otherwise we saw nothing else of note and the slow spring migration continues, though I’m not going to complain too much. This entry was posted in Rare Birds, Spring Bird Reports and tagged Longspurs, Smith's Longspur on April 28, 2013 by rhughes. I had high hopes for Montrose this morning but it was very slow. I guess it was too cold last night and the winds were too easterly. I saw nothing of note there. There’s always tomorrow, though at this rate it might not be until the middle of May before we see warblers. This entry was posted in Spring Bird Reports on April 26, 2013 by rhughes. Both Long-eared and Short-eared Owls were at Montrose on Saturday, April 13. The Long-eared Owl was roosting in a vine tangle near the Magic Hedge and the Short-eared Owl was flying around the point. Two Long-eared Owls were in the same area the day before. Seeing both Asio owls in the same day at Montrose is unusual, and I can’t remember the last time I’ve done this. It continues to be an unusually cold spring in the Midwest and as a result migration is behind schedule. This entry was posted in Spring Bird Reports and tagged Long-eared Owl, Owls, Short-eared Owl on April 16, 2013 by rhughes. Goose Pond, Indiana Spotted Redshank! Karen Mansfield and I drove down to Goose Pond Fish and Wildlife Area in Greene County, Indiana on March 30 to look for the Spotted Redshank that had been found there a couple days earlier. Spotted Redshank is a code 4 ABA rarity, with only a handful of inland North American records, as well as a lifer for Karen and I, so we were doubly excited about seeing this bird. When we got near the town of Dugger, not far from Goose Pond, a thick fog developed, possibly the worst fog I’ve ever encountered, with visibilities down to about 100 yards at best. The fog didn’t let up when we arrived at Goose Pond and my heart sank a little as I realized we wouldn’t be able to see the bird in such conditions. When we arrived at County Road 400S we saw cars from several different states parked along the side of the road and a large contingent of birders lined up on the levee at area E, one of two areas where the bird had been seen. We joined the group and waited for the fog to lift. We could hear Greater and Lesser Yellowlegs, Pectoral Sandpipers and other shorebirds in the field but the fog reduced most of these to nothing more than shadowy silhouettes. After about an hour and a half the fog started to lift and we could visually identify the birds we were hearing. Within a few minutes someone yelled out that the redshank was in field B, about a half mile from where we were, so we picked up our gear and walked as fast as we could to what was going to be our experience-of-a-lifetime Spotted Redshank. When we neared the area we saw people walking towards us, saying and gesturing that the bird had flown back to area E. Undaunted, we turned around and raced back to area E and found the bird at some distance in the same field we had just been scoping. Not more than 2 minutes later the bird got up and flew off to the north, apparently back to area B, so back to area B we raced. By this time I was working up a good sweat and a good irritation that the bird was playing so hard to get, but it settled down and gave us nice long looks and a few distant photos. All’s well that ends well. This entry was posted in Non-Montrose Birding, Rare Birds, Spring Bird Reports and tagged Shorebirds, Spotted Redshank on April 12, 2013 by rhughes. I had a Short-eared Owl this morning, my first of spring at Montrose. I was standing at the end of the fishhook pier when the bird flew in front of me and out over the lake. I suspect the bird flushed out of the dunes. I also had a small group of Redheads and Greater and Lesser Scaup in the lake off the end of the pier. Other than that I saw nothing else of note. This entry was posted in Spring Bird Reports and tagged Owls, Short-eared Owl, Waterfowl on April 4, 2013 by rhughes. I had a Caspian Tern and Yellow-bellied Sapsucker this morning. Both are new for me for the year. It was very cold today, more like late February than early April. If this is an April Fool’s joke I’m not laughing. A nice warm-up is forecast for the end of the week and weekend. There should be a big push of birds if this happens. This entry was posted in Spring Bird Reports and tagged Caspian Tern, Terns, Woodpeckers, Yellow-bellied Sapsucker on April 1, 2013 by rhughes.